The University of Southampton has received two nominations in the prestigious Times Higher Education (THE) Awards 2012. The University has been shortlisted in the categories of Outstanding ICT Initiative of the Year and Outstanding Contribution to Sustainable Development. The awards represent a unique and high profile opportunity to celebrate the excellence and amazing achievements of UK higher education institutions, and reaffirm the commitment to the two core pursuits of higher education: teaching and research. Outstanding ICT Initiative of the Year – for the University’s Open Data Service (data.southampton.ac.uk), which provides open access to University data to improve the life of the University community and our visitors, and increase the transparency of our operations. Uni-cycle has been set up to help and encourage students and staff at the University of Southampton to get on their bikes and reduce their environmental impact in a number of ways. By refurbishing unwanted and donated bikes and putting them back into use, we are increasing the number of staff and students cycling to the University – reducing congestion and improving wellbeing – as well as cleaning up the campus and reducing the amount of waste going to landfill. The project is jointly run between the University’s Transport Team and Volunteers, with student volunteers taking an active role in identifying, repairing and selling bikes at Uni-Cycle events. Refurbishments are carried out by a qualified bike engineer, who also provides a monthly ‘Bike Doctor’ service where staff and students can bring their bikes for free tune-ups and repairs. In two years, the scheme has so far refurbished over 100 bikes that have been sold to University staff and students as cheaply as possible, generating over £3,000, which has been reinvested in the project. The University has developed a number of applications using the data.southampton.ac.uk datasets, but as the data is all open, our staff and students are developing applications as well. Data, published under an open government licence, is available on our sites, buildings, opening hours of services, prices in the restaurant, organisational structure, research facilities, and equipment, amongst others. The data and associated applications are transforming student life. The open data site tells students what’s on (the Events Calendar combines 73 different information feeds to provide a comprehensive overview of university activity), where things are (interactive maps show all teaching, leisure and catering facilities and links to all the data about them) and even how to get there (with real time bus data from the Council linked to maps showing bus stops). By drawing data from other open data sources, such as Unistats, we have linked information about our courses with NSS scores and other key data, giving prospective students more information than ever before, and easily available in one place. The benefits are not just for students. 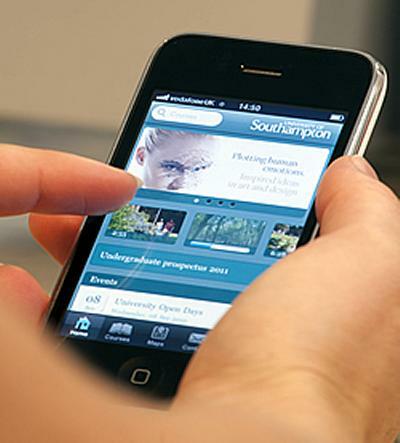 By collecting and publishing data on our research facilities and major items of equipment, http://data.southampton.ac.uk/facilities.html, we are encouraging reuse of existing equipment by Southampton researchers, but also alerting academic peers and industry to facilities which they might wish to rent time on. Such examples show the exciting potential of the service, which will continue to grow in the future as open data becomes increasingly joined up internally and with external organisations.